"Furze" redirects here. For other uses, see Furze (disambiguation). "Whin" redirects here. For Petty Whin, see Genista anglica. For the radio station, see WHIN. 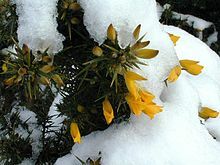 Ulex (commonly known as gorse, furze or whin) is a genus of flowering plants in the family Fabaceae. The genus comprises about 20 species of thorny evergreen shrubs in the subfamily Faboideae of the pea family Fabaceae. The species are native to parts of western Europe and northwest Africa, with the majority of species in Iberia. Gorse is closely related to the brooms, and like them, has green stems and very small leaves and is adapted to dry growing conditions. However it differs in its extreme thorniness, the shoots being modified into branched thorns 1–4 centimetres (0.4–1.6 in) long, which almost wholly replace the leaves as the plant's functioning photosynthetic organs. The leaves of young plants are trifoliate, but in mature plants they are reduced to scales or small spines. All the species have yellow flowers, generally showy, some with a very long flowering season. In full flower at Dalgarven Mill in Scotland. Common gorse flowers a little in late autumn and through the winter, coming into flower most strongly in spring. Western gorse and dwarf furze flower in late summer (August–September in Ireland and Great Britain). Between the different species, some gorse is almost always in flower, hence the old country phrase: "When gorse is out of blossom, kissing's out of fashion". Gorse flowers have a distinctive coconut scent, experienced very strongly by some individuals, but weakly by others. Ulex breoganii (Castroviejo & Valdes-Bermejo) Castrovioejo & Valdes-Bermejo. Ulex airensis Esp.Santo et al. Ulex rivasgodayanus (Cubas) Cabezudo & Pérez Lat. Ulex subsericeus (Cout.) Rivas Mart., T.E.Díaz & Fern.Gonz. Gorse may grow as a fire-climax plant, well adapted to encourage and withstand fires, being highly flammable, and having seed pods that are to a large extent opened by fire, thus allowing rapid regeneration after fire. The burnt stumps also readily sprout new growth from the roots. Where fire is excluded, gorse soon tends to be shaded out by taller-growing trees, unless other factors like exposure also apply. Typical fire recurrence periods in gorse stands are 5–20 years. Gorse thrives in poor growing areas and conditions including drought; it is sometimes found on very rocky soils, where many species cannot thrive. Moreover, it is widely used for land reclamation (e.g., mine tailings), where its nitrogen-fixing capacity helps other plants establish better. Gorse is a valuable plant for wildlife, providing dense thorny cover ideal for protecting bird nests. In Britain, France and Ireland, it is particularly noted for supporting Dartford warblers (Sylvia undata) and European stonechats (Saxicola rubicola); the common name of the whinchat (Saxicola rubetra) attests to its close association with gorse. The flowers are sometimes eaten by the caterpillars of the double-striped pug moth (Gymnoscelis rufifasciata), while those of the case-bearer moth Coleophora albicosta feed exclusively on gorse. The dry wood of dead gorse stems provides food for the caterpillars of the concealer moth Batia lambdella. In many areas of North America (notably California and Oregon), southern South America, Australia, New Zealand and Hawaii, the common gorse, introduced as an ornamental plant or hedge, has become an invasive species due to its aggressive seed dispersal; it has proved very difficult to eradicate and detrimental in native habitats. Common gorse is also an invasive species in the montane grasslands of Horton Plains National Park in Sri Lanka. Gorse readily becomes dominant in suitable conditions, and where this is undesirable for agricultural or ecological reasons control is required, either to remove gorse completely, or to limit its extent. Gorse stands are often managed by regular burning or flailing, allowing them to regrow from stumps or seed. Denser areas of gorse may be bulldozed. In the island of Guernsey, Channel Islands, many traditional farms had furze brakes. The prolific gorse and bracken would be cut, dried and stored to be used as fuel, with farmhouses having purpose built furze ovens. Gorse wood has been used to make small objects; being non-toxic, it is especially suited for cutlery. In spite of its durability it is not used for construction because the plant is too small and the wood is unstable, being prone to warping. Gorse is useful for garden ornaments because it is resistant to weather and rot. Gorse has been listed as one of the 38 plants that are used to prepare Bach flower remedies, a kind of alternative medicine. The furze is the badge of the Sinclair and MacLennan clans of Scotland. Compare this with the broom (planta genista) as the emblem and basis of the name of the Plantagenet kings of England. The flower, known as chorima in the Galician language, is considered the national flower of Galicia in northwest Spain. The gorse is also the emblem of Brittany and is regaining popularity in Cornwall, particularly on St Piran's Day. Its flammability rendered gorse symbolic as quickly flammable and quickly burning out; for example, Doyle, in his book Sir Nigel, has Sir John Chandos say: "... They flare up like a furzebush in the flames, but if for a short space you may abide the heat of it, then there is a chance that it may be cooler... If the Welsh be like the furze fire, then, pardieu! the Scotch are the peat, for they will smolder and you will never come to the end of them." In many parts of Britain, especially Devon and Cornwall where it is particularly prevalent on the moors, the expression "kissing's out of fashion when the gorse is out of blossom" is a traditional jest as common gorse is thought to be always in bloom. Gorse, or rather furze as it was usually known in the West Country, sprigs were a traditional May Day gift between young lovers in the region, when in fact the blossom is at its peak. In the first chapter of A. A. Milne's Winnie-the-Pooh, the titular character, after unsuccessfully climbing up a tree to get some honey, falls out of the tree and into a gorse bush. In Sir Arthur Conan Doyle's 1892 short story "The Adventure of Silver Blaze", the trainer of a champion race horse temporarily hangs his coat over a furze bush. In Thomas Hardy's novel The Return of the Native, Clym Yeobright, the native of the title, becomes a furze cutter after his eyesight suffers from excessive reading. ^ "Gorse". Plantlife International. Retrieved 14 March 2011. ^ Moore, Charles (28 September 2009). "Richard Mabey, a writer dropping down to see the natural world". The Telegraph. Retrieved 14 March 2011. ^ "ILDIS LegumeWeb entry for Ulex". International Legume Database & Information Service. Cardiff School of Computer Science & Informatics. Retrieved 15 April 2014. ^ USDA; ARS; National Genetic Resources Program. "GRIN species records of Ulex". Germplasm Resources Information Network—(GRIN) [Online Database]. National Germplasm Resources Laboratory, Beltsville, Maryland. Retrieved 15 April 2014. ^ a b c "The Plant List entry for Ulex". The Plant List. Royal Botanic Gardens, Kew and the Missouri Botanical Garden. 2013. Retrieved 15 April 2014. ^ Pausas; et al. (2011). "Fires enhance flammability in Ulex parviflorus" (PDF). New Phytologist. 193 (1): 18–23. doi:10.1111/j.1469-8137.2011.03945.x. PMID 22039968. ^ Lalith Gunasekera, Invasive Plants: A guide to the identification of the most invasive plants of Sri Lanka, Colombo 2009, pp. 88–89. ^ Van Hoeffler; et al. (2007). "Suitability of Ulex fodder: a biochemical analysis with emphasis on nutritional content". European Journal of Agricultural Science. 20 (13): 89–102. ^ "Experimental Archaeology Site at Tunstall". Suffolk County Council. We have tried different woods as fuel to see which is most efficient and our favourite is dead gorse, collected locally and a dominant species on the sandy soils in this area. Analysis of woods used in the Roman salt industry that took place on the estuary a mile away shows they were using the same fuel. ^ "Out in the fields of gold". Guernsey press. 19 April 2012. ^ "Les Prevosts farm". guernseygoasdoue. 2015-01-24. ^ DS Vohra (1 June 2004). Bach Flower Remedies: A Comprehensive Study. B. Jain Publishers. p. 3. ISBN 978-81-7021-271-3. Retrieved 2 September 2013. ^ Doyle, Sir Arthur Conan (1906). Sir Nigel. London: Smith, Elder & Co.
^ "Kissing's in fashion …". 31 December 2014. Wikimedia Commons has media related to Ulex. Chisholm, Hugh, ed. (1911). "Furze" . Encyclopædia Britannica (11th ed.). Cambridge University Press.